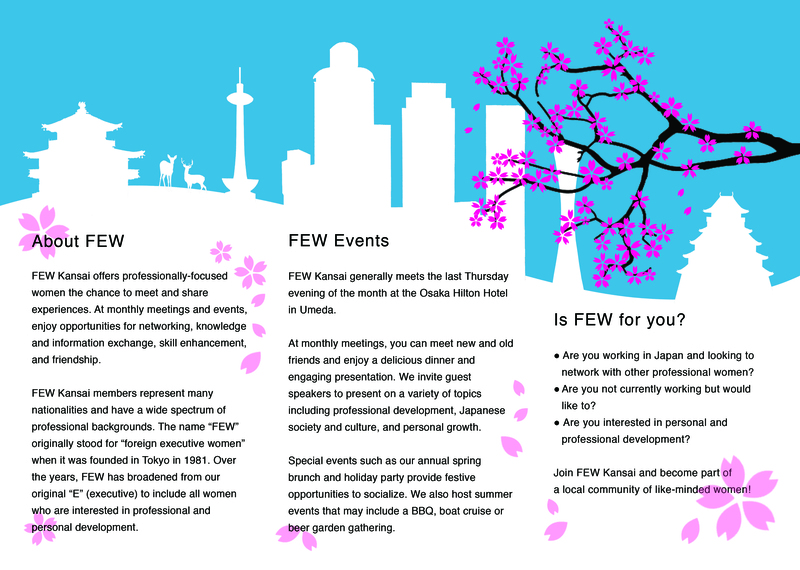 FEW was established as a non-profit organization to support foreign women in Japan, both professionally and socially. Being literally “few” in the world, FEW offers a friendly and supportive atmosphere to meet, network and find like-minded friends. 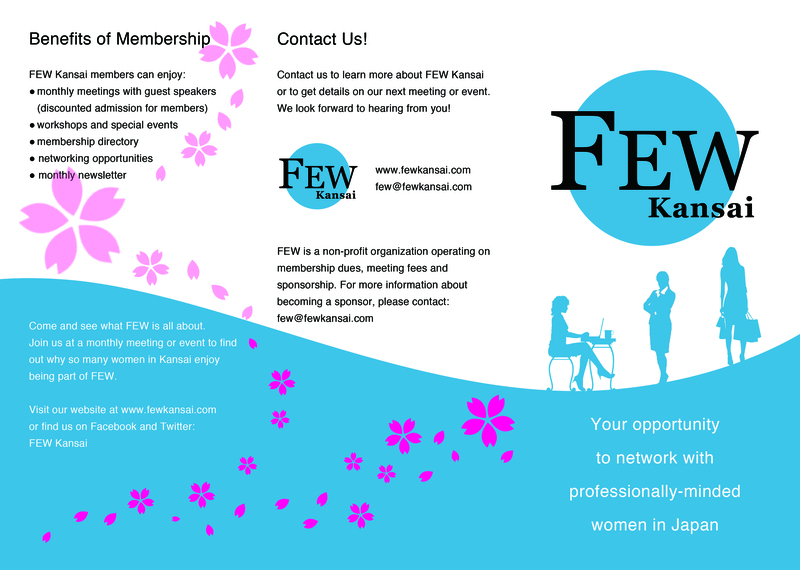 From this idea stems our mission: “To provide a forum for networking, career development, knowledge and information exchange, support and friendship among foreign women living in Kansai." FEW Kansai currently has around 50 active members, who come from countries and cultures around the world. They represent a wide spectrum of backgrounds, including (but not limited to!) consultants, educators, artists, students and entrepreneurs. The name "FEW" originally stood for "foreign executive women" when it was founded in Tokyo in 1981. Over the years, FEW Kansai has broadened from our original "E" (executive) to include all women who are interested in professional and personal development. The backbone of FEW Kansai is the monthly dinner meeting, held on the last Thursday of the month at the Hilton Hotel in Osaka. We invite guest speakers to present on a variety of topics, such as professional development, Japanese society and culture and personal growth. Non-members are welcome to attend monthly meetings as guests. Reservations for the monthly meetings must be made in advance via email. Special events such as our annual Spring Brunch and Holiday Party provide festive opportunities to socialize with other FEW members and guests. We also host summer events that may include a BBQ, boat cruise or beer garden gathering. FEW is a nonprofit organization run by volunteers and solely funded by membership dues. A Board of Directors that is elected for a one-year term by the membership governs FEW Kansai. The Board meets monthly.